When it comes to roofing materials, you have many choices today. You might opt for standard asphalt shingles due to their affordability, or you might choose slate because of its beauty and strength. However, perhaps the best choice for your New Orleans home or business is metal roofing. Let’s take a closer look at why? When it comes to your roof, metal roofing in New Orleans offers the best in terms of durability and life. Asphalt shingles might be touted as the most affordable solution out there, but when you compare the cost of replacing that roof every 10 or 15 years with the fact that metal roofing can last upwards of five decades with minimal maintenance, the reality begins to come through. 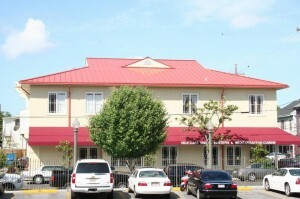 Metal roofing for New Orleans homes and businesses offers the best mixture of durability and longevity on the market. Couple that with the fact that you can choose virtually any color or pattern you might want to ensure you get the aesthetic you desire, and the choice becomes obvious. Of course, metal roofing isn’t the only solution out there that offers plenty of strength and resilience. Slate and ceramic tile are both renowned for their strength and ability to withstand the rigors of long-term exposure on the roof. However, there are additional problems with these materials. For instance, both tiles and slate are enormously heavy. This means that if your roofing system’s substructure is not up to the task, they’re not available for you because of the potential for roof failure. In addition, both slate and tile can crack when hit by blown debris or hailstones (metal doesn’t have this issue). Many homeowners and businesses worry that they will have trouble getting a metal roof because of the need for custom work. JOI Roofing specializes in a variety of custom metalwork, including sheet metal and even copper. This ensures that we can provide every single client with the perfect solution to their roofing needs. At JOI Roofing, we’re proud to offer metal roofing to New Orleans residents throughout the city, but we also provide expert help and service to those living on both sides of the lake. We’re here when you need us, and we can provide both commercial and residential metal roofing.